The Campaign for Clean Air in London (CCAL) has received a personal letter from Tessa Jowell, Minister for the Olympics and London. The Minister’s letter responds to CCAL’s letter dated 17 January 2008 that urged the Government to commit to take all necessary actions to ensure that the London 2012 Olympic Games and the London 2012 Paralympic Games (London 2012) will, at an absolute minimum, comply sustainably and fully with the letter and spirit of all applicable UK and European Union (EU) air quality laws and the Host City Contract for London 2012. CCAL is pleased to have received replies also from the International Olympic Committee (IOC) and Xavier Gonzales, Chief Executive of the International Paralympic Committee (IPC). CCAL has sought, without any success, reassurance also from David Higgins, Chief Executive of the Olympic Delivery Authority, and Lord Moynihan, Chairman of the British Olympic Association. The replies from Tessa Jowell and Xavier Gonzales are published in full at the end of this Campaign Update. CCAL is not publishing the IOC’s reply at its request. Simon Birkett, Principal Contact for CCAL, said “The Campaign for Clean Air in London thanks Tessa Jowell, Minister for the Olympics and London, for responding personally to its letter that urged the Government to commit to take all necessary actions to ensure that London 2012 will, at an absolute minimum, comply sustainably and fully with the letter and spirit of all applicable UK and European Union (EU) air quality laws and the Host City Contract for London 2012. “First, for highlighting again that the UK is breaching EU air quality laws and that plans will need to be approved by the European Commission [later this year] to secure time extensions to comply with them. “It is notable second for side-stepping completely the representation in the Mayor of London’s letter to the International Olympic Committee (IOC) dated 29 October 2004 which stated “I believe London has the capacity and ambition to deliver the best Games ever – for athletes, for sustainability and the environment, for lovers of sport in the UK and beyond”. “The Minister’s focus, third, on sustainability without mentioning the environment is sleight of hand when sustainability means nothing unless it is linked to an absolute environmental standard i.e. the greenest Games ever. Furthermore, the London 2012 Sustainability Plan trumpeted by the Minister mentions air quality once only in the whole document (when it refers on page 12 to venue operations including “pollution monitoring (water and air quality)”). 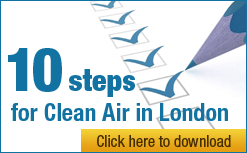 A plan that puts air quality at the heart of London 2012 is needed urgently. It must be backed by independent assurance reports from the Commission for Sustainable London 2012 as the Chief Executive of the International Paralympic Committee has rightly said. Sustainable breaches of air quality laws would be no achievement for London 2012. “The Minister’s letter is notable fourth for dismissing widespread breaches of air quality laws, which are expected still to affect some 400,000 people in London in 2012, with the words “a limited number of pollution hotspots remain”. Tessa Jowell refers in her letter to CCAL being “in correspondence with the Greater London Authority about the actions that are being taken to ensure that European Union (EU) Limit Values for nitrogen dioxide (NO2) are achieved urgently and sustainably throughout London”. In fact, despite more than an year of correspondence that has included the Department for Transport and the Department for Environment, Food and Rural Affairs, CCAL has seen no evidence yet that the Government has any plan to comply with NO2 air quality laws in London never mind any “actions that are being taken to ensure that European Union (EU) Limit Values for nitrogen dioxide (NO2) are achieved urgently and sustainably throughout London” as the Minister implies. CCAL continues to highlight the UK’s ongoing lack of plans to comply fully with air quality laws to the European Commission. “Tessa Jowell’s letter is notable fifth for ducking responsibility and seeking to pass it to others almost all whom do not have legal responsibility or sufficient powers to comply with the UK’s air quality obligations as a Member State. This is despite the fact that, as Olympics Minister, it was she who wrote to the International Olympics Committee on 9 November 2004 to provide environmental guarantees in support of London’s bid to host the Olympic Games and Paralympic Games in 2012. “Tessa Jowell’s letter is notable finally for not making any commitments. This is very disappointing given that all four of the main Mayoral candidates commented in support of CCAL’s concerns about air quality in London ahead of 2012. “Tessa Jowell joins David Miliband, Ruth Kelly and Hilary Benn in refusing to commit the Government to comply fully with air quality laws. It is time now therefore, that the Prime Minister cleans up this Ministerial mess and insists that the UK will comply fully with air quality laws by London 2012. CCAL urges the Prime Minister to make such a commitment now on behalf of the Government and the whole UK Olympic family. CCAL’s petition on the Prime Minister’s website, which closes on 13 March 2008 and which has been signed by many of London’s leading politicians and community groups, makes a similar call. “European legislation, the Host City Contract and the representations made to the IOC, all point to the UK Government and London needing to ensure that Londoners, athletes and visitors are all breathing clean air sustainably in London by early 2012. What a wonderful advertisement and legacy for London that would be. The alternative of legal action by the European Court of Justice and the IOC over breaches of air quality laws in 2012 is too awful to imagine. “When the political will existed in the past, air pollution was tackled quickly whether as the ozone layer, leaded petrol, acid rain or pea-souper smogs. It really is that simple” said Simon Birkett, Principal Contact, for CCAL. Finally, Simon Birkett thanked the International Olympic Committee and Xavier Gonzales, Chief Executive of the International Paralympic Committee most warmly for their replies. He expressed dismay though that no reply had been received yet from the Olympic Delivery Authority after months of pressing for one and that he hoped still for a reply from the British Olympic Association. In a letter to the Evening Standard published on 6 March 2008 CCAL highlighted that the points made earlier this week by Tony Travers about London needing radical action to improve its transport systems apply equally to environmental policies. In particular there is no plan yet from anyone standing for Mayor of London that will result in London complying with air quality laws. If the candidates explained the real seriousness of the air quality problem, with air pollution averaging well over twice the World Health Organisation’s maximum recommended levels near many of London’s busiest streets, voters would welcome the more radical environmental policies needed. putting awareness, education, demand management and modal choices at the heart of a radical air quality plan for London. All this needs to focus first on the most polluted areas, to be mixed with incentives and to give people as much notice as possible to minimise their costs. The Government too will need, at last, to play its part in supporting London e.g. by setting national standards for pollution abatement equipment for older vehicles. In practice, a package like this needs to be operating by January 2012 if London is to comply with air quality laws and the Host City Contract. In a letter of 29 October 2004, addressed to the President of the International Olympic Committee (IOC), the Mayor of London provided guarantees in support of London’s bid to host the Olympic Games and Paralympic Games in 2012. Details of this letter were sent to CCAL by the Greater London Authority in response to a Freedom of Information Request. Mayor Livingstone went further and wrote “…the Greater London Authority understands that all representations… shall be binding on the city”. Mayor Livingstone’s representation and accompanying environmental and other guarantees from London to the IOC were supported formally by legal undertakings to the IOC from the Prime Minister (9.11.2004), Tessa Jowell (9.11.2004), the First Minister of Scotland (31.10.2004), the First Minister of the Welsh Assembly Government (29.10.2004), the London Borough of Newham (24.9.2004), Essex County Council (20.9.2004) and the British Olympic Association (18.10.2004). On the back of these and many other representations, the IOC awarded London the 2012 Olympic and Paralympic Games in July 2005. A new EU directive on air quality is expected to be formally adopted by Member States in May or June 2008 and Member States will be required to transpose the directive into national law within 2 years of adoption. The directive consolidates existing EU legislation, introduces new controls on fine particles (PM2.5), where there is no safe level of exposure, and also provides for extending the timeframes for meeting limit values for particles (PM10) and nitrogen dioxide (NO2). The latter is subject to approval of detailed plans setting out how the limit values will be achieved within the extended timescale. The Government published a revised Air Quality Strategy in 2007 for meeting EU limit and target values for air pollutants. Monitoring data shows that objectives for benzene, 1,3-butadiene, carbon monoxide and lead were met throughout the UK in 2006, and the UK is meeting current objectives for all air pollutants in most parts of the country. However, the Government is aware that a limited number of pollution hotspots remain. It is therefore expected that, subject to public consultation, the UK will submit plans to the European Commission to secure additional flexibility on how the limit values will be achieved. The Department for Environment, Food and Rural Affairs (Defra), is the lead Department on this matter and will be responsible for taking forward this consultation and any policy developments. At the local level, local authorities have statutory duties for local air quality management (LAQM) under Part IV of the Environment Act 1995. They are required to carry out regular reviews and assessments of air quality in their area against the objectives in the Air Quality Regulations 2000. Where it is found that the objectives are not being, or are unlikely to be, met authorities must designate air quality management areas and prepare and implement remedial action plans to tackle the problem. Local authorities which have air quality management areas must produce an air quality action plan between 12-18 months following designation of their air quality management area, as set in Policy Guidance LAQM.PG(03). As you are aware, the Mayor has responsibility for ensuring the LAQM regime is undertaken appropriately by London boroughs. We understand that you are in correspondence with the Greater London Authority about the actions that are being taken to ensure that EU Limit Values for nitrogen dioxide are achieved urgently and sustainably throughout London. I am copying this letter to Rt Hon Hilary Benn MP, Secretary of State for Environment, Food and Rural Affairs for his information. Fundamentally, the issue of implementing/enforcing air quality policy and standards is one for the UK Government and for the Mayor of London. It is not one which sports organizations can respond to specifically. Of course, good air quality is a key aspect of healthy sport and the IPC [International Paralympic Committee] within its scope of influence has every confidence in the measures being implemented by the London 2012 Organising Committee [LOCOG] and in the wider sustainability programme of the London 2012 Games. The IPC has regular progress reviews with LOCOG and follows with interest the independent assurance reports of the Commission for a Sustainable London 2012.